Diamond Services' desktop-sized mini Raman Spectrometer. A mini Raman Spectrometer, which is able to accurately detect HPHT and CVD lab-grown synthetic diamonds and HPHT colour-treated diamonds, as well as diamond simulants, will be unveiled by Hong Kong-headquartered Diamond Services in September. It is designed to provide individual diamond and jewellery companies with a technological capability that, thus far, has typically been the exclusive domain of well-equipped gem labs. 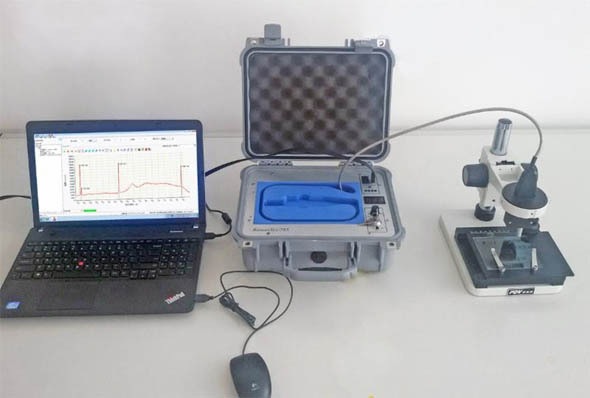 The desktop-sized device, which has been designed specifically for operation by non-technical personnel in the diamond sector, is able to test both mounted and non-mounted stones, and deliver its results in an easy-to-read and interpret format. It will cost up to 90 per cent less than the equivalent Raman Spectrometer systems used by the leading gem labs. "We believe that the new system is a game changer," said Joseph Kuzi, Diamond Services' founder and President. "To date, diamond and jewellery companies have had to rely on methods that screen out stones that are more likely to be treated or synthetic, but they then need to refer them properly equipped laboratories for definitive testing. The mini Raman Spectrometer will enable them to conclusively identify such goods on the spot. With a growing number of undisclosed treated and synthetic diamonds in the market, it is an affordable device that allows one to make rapid business decisions without increasing the level of risk." Diamond Services' mini Raman Spectrometer will be shown and demonstrated to the public for the first time at the Hong Kong Jewellery & Gem Fair in September. Now undergoing final testing, some 40 units have already been ordered on spec. Diamond Services was established in 2012 in Hong Kong as a developer and provider of gemmological services and technology. Committed to the release of one new synthetic diamond detection device per year, in 2013 the company first introduced the DiamaPen®, a hand-held laser device that is able to detect fancy colour synthetic diamonds. In 2014 it introduced DiamaTest®, an innovative system that screens both loose and colourless diamonds for synthetics, for which it won the prestigious JNA 2014 Award.